Photographed on the Saturday 06 August 2016. 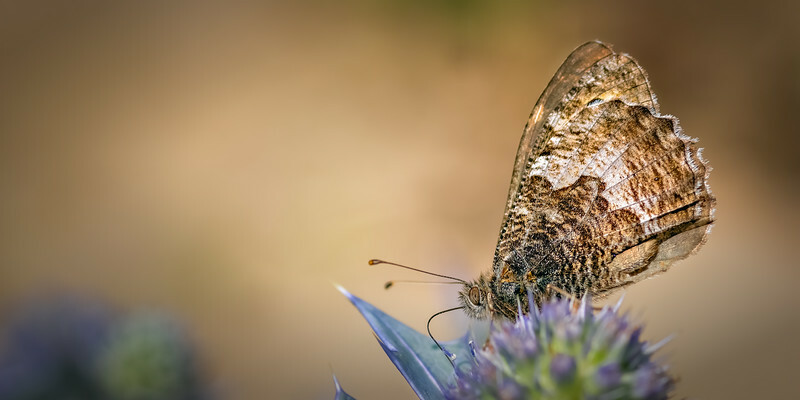 This is an image of the Grayling Butterfly (Hipparchia semele) and belongs to the Class Insecta, Order Lepidoptera, Family Nymphalidae and Genus Hipparchia and commonly placed into the group, ‘Browns’. The name Grayling was derived from the early English ‘Tonbridge Grayling’, and prior to that the wonderful names of ‘Rock-Eyed Underwing’ and ’Black-eyed Marble’. This butterfly is one of our largest Browns. The Family Nymphalidae includes the Browns, Fritillaries and Vanessids which include both some of our rarest butterflies and also some of our most familiar garden butterflies. This image was taken as the Grayling was feeding on Sea Holly here on the Formby coast in the Dunes, which is typical habitat for this species. In all probability, because this Grayling was so approachable and seen out in the middle of the day it is probably a male. These butterflies are distributed throughout much of Britain being a coastal and dune heath/lowland heath specialist. It prefers dry areas of poor soil such as sand where the vegetation can be sparse. Most sightings tend to be of males as the female is quite secretive and seldom seen except when laying eggs. More often these butterflies are more commonly seen on bare sand/ground, or perhaps not seen, i.e. they have very cryptic markings which allow them to blend very well against the background. When feeding the males can be very approachable and almost tame. If seen on the ground they will invariably be noticed to incline their wings to catch the sun. This is due to the fact that Graylings need to maintain their body temperature at around 32¬oC and this species is adapted to inhabiting warmer micro-habitats than almost any other species of British butterfly.